Book your KidZania London tickets - The UK’s first educational entertainment experience where children aged four to fourteen can learn real-life skills in a 75,000sq ft. child-size city built just for them. Watch the excitement on their faces as kids explore over 60 unique and exciting professions through real-life role play adventures in a fun and safe environment. Having welcomed over 42 million visitors worldwide, KidZania is a global phenomenon and one of the world’s fastest growing educational entertainment brands with 19 locations across five continents – and now for the first time KidZania has landed in London. Where else could your child be a Pilot? Get Ready for a Better World. This Easter: Nike launch their department of Unimaginable, where Kids can create their own designs and win a chance for themselves and a parent or guardian to Nike HQ in Portland, USA. Wrestlemania comes to KidZania London between March 30th and April 22nd. Become an energy Champion at the Shell Forecourt and Energy lab and go Easter Egg hunting around the city as part of Yoshi’s Easter Egg hunt (8th-21st April). 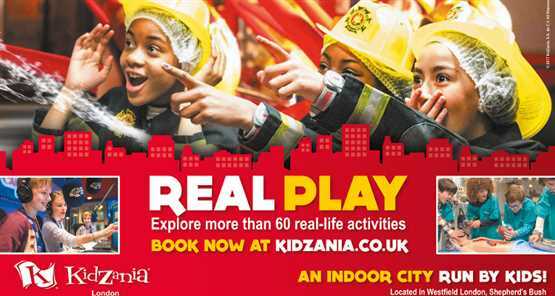 You are spoilt for choice of exciting Easter activities at KidZania London this April. Book tickets now! We strongly advise that you arrive at KidZania London 15 -20 minutes before your desired entry time as there can be queues during peak operating hours. Everyone intending to visit KidZania is required to have a valid ticket. When programming your Sat Nav device, use the postcode W12 7GA or type in Ariel Way, W12. KidZania London is easily accessible via the M4, M40 and M25. Routes 31, 49, 207, 237, 260, 607 and C1 run from Shepherd's Bush via the Westfield Interchange and terminate at White City Bus Station. Route 148 will run to the Bus Station via Wood Lane. Shepherd's Bush also continues to be served by buses 72, 94, 95, 220, 272, 283, 295 and N207. Shepherd's Bush Overground Station provides links to the Central Line Tube Station, buses and taxis. The station provides direct connections to Clapham Junction with services to South London and southern counties, including trains to Gatwick Airport. Shepherd's Bush Station is also served by Southern trains between East Croydon and Watford Junction. Central Line: Shepherd's Bush and White City. Hammersmith & City Line: Wood Lane and Shepherd's Bush Market. The special offer ticket will run for bookings made between 25th March- 23rd April 2019 for redemptions between 6th April- May 31st 2019. The Special offer ticket is valid on the 13.30pm time slot and any timeslot thereafter, up until 4 hours before closing each date (subject to availability). Dependant on the date the customer choses to pick depends on opening times.